Hello everyone, welcome to Nittro forums! Nittro has been out for more than two years now, but until today developers had no single place to ask their questions or learn about new releases. This is something I'd like to change here. In the Releases category I'll be posting a topic for each new Nittro release along with a brief explanation of the changes it brings. During the sign up process you have the option to subscribe to e-mail notifications about new topics in this category; these will be sent at most once per day in the morning. The Q&As category is the place to ask any and all questions you might have about development with Nittro. It's a category that I have a subscription for, so I should know about your questions right away and typically should be able to get back to you in a matter of hours, if not minutes. Also the forum itself is written in Nette + Nittro and it's brand new, so there might be some bugs there as well - if so, please feel free to report them either via e-mail or in the Q&As category of the forum itself. @jahudka @chemix hey guys, so I updated the way e-mails are generated at this forum, now the instant-notification e-mails have a unique subject per topic so that they'll group nicely in your gmails and also I added a couple of mail headers like List-Unsubscribe (along with a fancy link in the mail body) to allow users to toggle their subscriptions off easily if they become too bothersome. Let me know what you think! 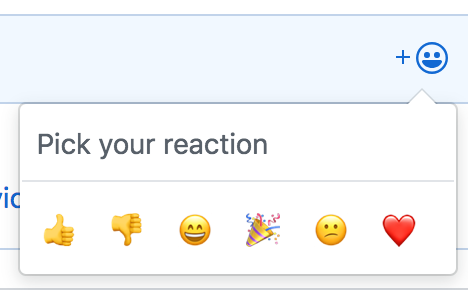 not sure how I'd go about implementing this, since you in fact didn't comment with Emoji only - your comment contained a quote of the comment you were replying to..
nice to have definitely, but not a priority right now..
Hi! Github authentication would be great. But anyway, looks great! @chemix @milo re: SSO - well if we can do SSO through Github then I think that'd be the single best option - pretty much everybody who's a programmer has a Github account. On the other hand I'd rather not have to deal with fb or twitter; forum.nette might be nice, but if we have Github, then maybe it should be the other way around (forum.nette should have Github SSO as well)..